The Hillsborough County Sheriff's Office has found an effective way to warn drivers that they need to obey the school zone signs outside a local high school, even in the summer months. Corporal Shawn Napolitano tells ABC Action News his district received complaints about the flashing school zone beacons outside Newsome and Bloomingdale High Schools. Drivers thought they were broken because they were still flashing during the morning commute while students are out for the summer. However, schools across Hillsborough County are in their summer school session, so drivers need to abide by the listed school zones. 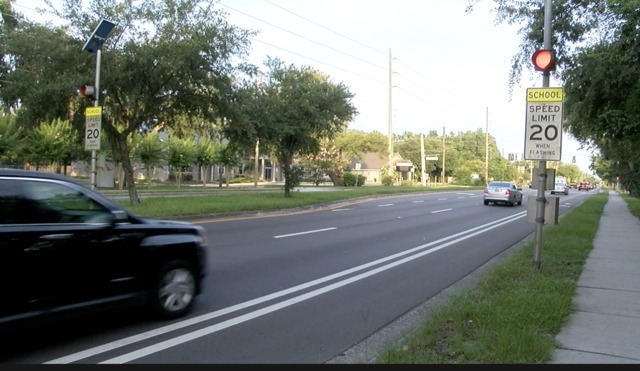 Napolitano tells us deputies watched drivers zooming past the school zones, so they put out a flashing billboard sign over the weekend that reads school is in session and to obey the school zone speed limit. With the flashing signs posted in both directions, Napolitano said it has helped make drivers more aware. "Just as Sheriff Chronister has asked, if you see something wrong in your community, say something to law enforcement, so we can look into it and address it," said Corporal Napolitano. A ticket for going 20 miles per hour over the speed limit in a listed school zone is more than $400. Napolitano warns that you should expect school zones to be enforced outside elementary, middle and high schools. The elementary schools also have crossing guards for the summer.